It took the redshirt freshman quarterback a couple of series to get going as he came out this game visibly nervous. As he settled into the game, he improved throughout and got into a groove with this offense. He did a lot of things to be impressed of for a young quarterback making his first start on the road. First, he read the field well and went through his progressions. He had plenty of time in the pocket thanks in large part to exceptional blocking from his offensive line (more about that in a moment) and was able to go through his progressions and find the open receiver. Second, he was poised and decisive. Once he locked on to his target, he was able to throw the ball cleanly with excellent mechanics for passes that were on the money in his receivers’ hands. He threw the ball into tight windows where the slightest inaccuracy would have led to an incompletion or interception. Last, he looked comfortable in the pocket. Even when it broke down, he showed great awareness in being able to shift and buy himself more time. When he didn’t have a receiver open, then he was able to take off and get a few yards on the ground. With the exception of a pair of interceptions, the first of which came from a bad situation in which he threw out of his own end zone and served as a 44-yard punt and the second which came on a bad read to Durham Smythe whom he expected to continue the route, there wasn’t much to be disappointed about with Book who completed 9 of his first 12 passes. The redshirt freshman put in a good performance considering it was his first start on the road in rainy conditions. 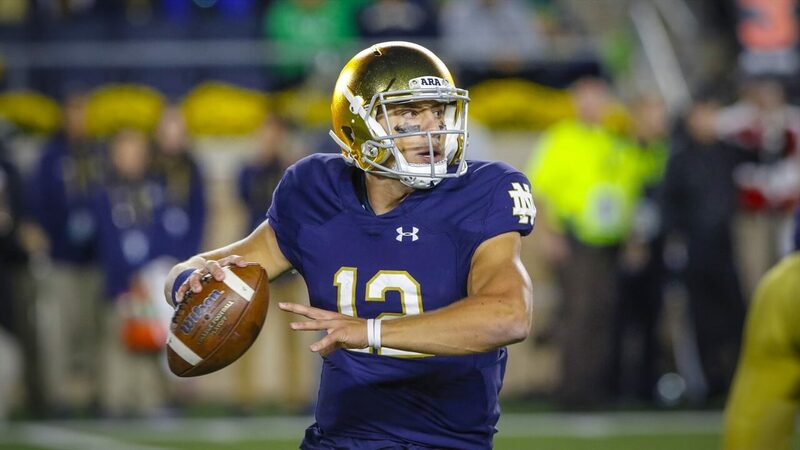 He also looked better than Brandon Wimbush in the areas or reading his progressions, pocket presence, throwing mechanics, and being poised and decisive where Wimbush can look jittery when the pocket breaks down or doesn’t see any open receivers. Book isn’t likely to unseat Wimbush with this performance, but earned a solid “B” and showed us that Brian Kelly has an alternative should Wimbush sputter or go down with injury again. Wimbush’s athleticism and arm strength give him a much higher ceiling, but he should be looking over his shoulder and constantly improving considering that there is a very capable passer behind him. I’ve been critical of this offensive line earlier in the season, but it looks as though they may have officially turned the corner. After being dormant against Georgia and for most of their road game in their record setting performance against Boston College, the offensive line has continued to improve throughout the season and are living up to the hype they received in the offseason. The line did a great job in pass protection on the day, giving Ian Book all day in the pocket to go through his progressions. There were instances where they read the blitz immediately and picked it up and when a blitzer got through, he was often picked up by the back. Book often had five or more seconds in the pocket to go through his progressions which allowed him to settle into the game and deliver the ball accurately. The line also did great in the running game once again. Notre Dame finished with two 100 yard rushers with Josh Adams getting a 73-yard touchdown with his first carry in the second quarter. The lone fully healthy runningback in Deon McIntosh took over for most of the second half and amassed 124 yards on 12 carries with 2 touchdowns. Even though North Carolina has one of the worst run defenses in the country and their team is littered with season ending injuries, this was another impressive performance for the offensive line who dominated UNC even without right guard Alex Bars who was injured early. If this offensive line played against Georgia now, we would probably be talking about a different Notre Dame team and a different outcome. The defense played well for most of the season, but with the exception of Georgia, they never really had a truly exceptional performance. Their tackling, while much improved, left a lot to be desired and they allowed teams to move the ball easily at times. That was not the case against UNC. It seemed that with a redshirt freshman quarterback making his first start on the road, the defense took a step forward on the day to help carry the team. The pressure on quarterback Chazz Surratt was consistent from the opening whistle. There was always a defensive player in Surratt’s face who was taken down for a pair of sacks and would have been taken down for another pair had Daelin Hayes and Nyles Morgan wrapped him up early in the game. The defense was in the backfield to capitalize on a fumble in which Surratt was unable to handle the ball due to the rain and on a different play, Julian Okwara ran clear into Surratt’s face, managed to bat the ball in the air, and come down with his own interception. The defense was disruptive all day and didn’t let the UNC offense breathe. Even when backing UNC onto their own 1-yard line just before the half, Elko dialed the pressure to get the safety which seemed to take wind out of UNC’s sails. The defense only allowed 265 total yards, 179 passing and 86 rushing, and had three takeaways. The early season returns on this defense have been impressive, and this was the step forward they needed right before the bye week as the second half schedule looks to be difficult with USC, NC State, Wake Forest, undefeated Miami, undefeated Navy, and Stanford all looking like tough games as five of those opponents ended the weekend ranked. The punt return game came alive with Chris Finke returning four punts for 44 yards with a long of 23 yards. Fans have been clamoring for more plays in the return game, and it looks as though they may have gotten it. It was a matter of time before the return game got started, and the returns on the day were a step in the right direction.